Constructed in 1869, the Bardavon Opera House has been the center of the Hudson Valley community for several generations. In 1923, it was transformed into a movie house, and in 1976, it was rescued from a scheduled demolition and revitalized into a vibrant performing arts space. Throughout its history, everyone from Mark Twain to Tommy Dorsey, from Theodore Roosevelt to Gregg Allman has graced its stage, and currently, it hosts an eclectic array of entertainment that includes classical performances, rock concerts, and film showings. 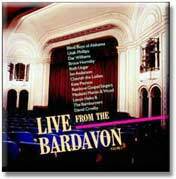 As a means for raising funds to maintain the building — a costly endeavor, to be sure — its management has assembled Live from the Bardavon, Volume 1, the first of a series of previously un-issued recordings made over the past few years at the esteemed venue. Naturally, it features as diverse a line-up as any compilation — albeit with an eye towards commercial viability — shifting seamlessly from the Blind Boys of Alabama’s heavenly harmonies on Nobody’s Fault to the delicate folk of Dar Williams’ February to the Irish lilt of Cherish the Ladies’ Waves of Kilkee. Elsewhere, Bruce Hornsby blends jazz, classical, and ragtime on a fusion of Rainbow’s Cadillac with Wrap Your Troubles in Dreams while Ian Anderson gives Locomotive Breath its loosest arrangement in years, although the kazoo accompaniment takes away some of the song’s steam. The highlight of the set, however, is the rousing rendition of Almost Cut My Hair, delivered with a quiet, but powerful fury by David Crosby’s CPR.